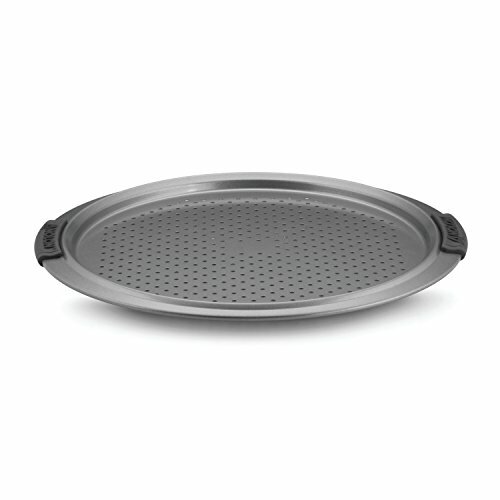 A pizza crisper is a pan with a perforated bottom designed to deliver as much heat as possible to the bottom crust. In addition to letting heat in to sear the bottom of the crust, the holes also allow steam to escape, preventing the dreaded soggy-crusted version of one of America's favorite foods. Use this pan for your home-made pizza dough or to reheat a store-bought pizza without the mess that may accompany cooking a frozen pizza directly on your oven rack. Heavy gauge construction resists warping. Comfortable silicone Anolon SureGrip handles provide a slip-free grasp. Dishwasher suitable and oven safe to 500°F/ 260°C. Lifetime Limited Warranty. Heavy gauge construction resists warping.